December has always been my favourite month of the year – the month that I always look forward to (starting from the beginning of the year) perhaps because of the good memories that I have had during Christmas since I was very young. I recall all the good old advertisements on television featuring products and shops like Coca Cola, Metro (Metro lights up your Christmas) and I do actually miss them a lot because nowadays, you just don’t get these advertisments on television anymore. Just listening to the jingles that sound in the shopping centers and supermarkets are enough to make my days better. It is that one month in the year that I will allow myself to sit back and relax a bit because the year is coming to an end soon and because I need to recharge for a better and busier year ahead. Just yesterday, the boy and I were so excited about the fact that it was the first day of Christmas and couldn’t wait for long to open up the first number on the chocolate advents calendars that daddy has bought for us – one advents calender each. I used to be able to take all the chocolates in the boxes and eat all that I wanted, but this year, I have lost all of that priviledge because the boy is all grown up at three years old and knows for sure that he is not going to give none of the chocolates up to anyone. He got the bigger box and I the smaller one; he therefore got the bigger chocolates as well. But all’s good because I would have given him the bigger box anyway. It makes all the difference to be able to share with my family and be with them during Christmas, so no complaints at all! 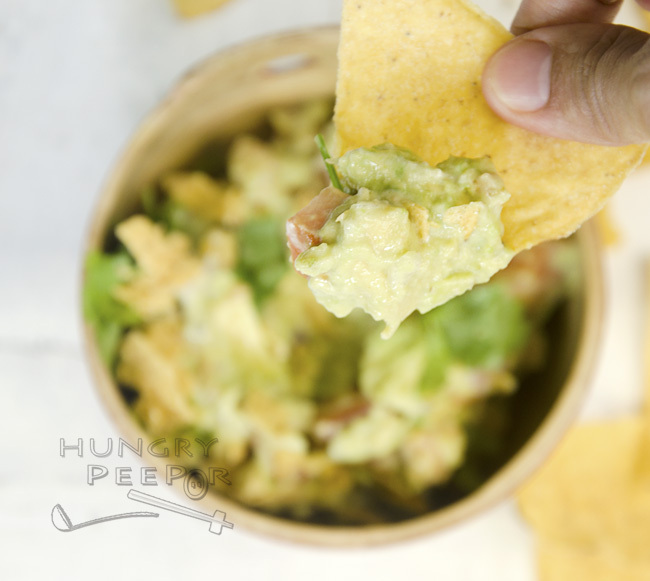 Here’s an ode to my first Christmas recipe – Christmas green avocado salsa with tortilla chips for a refreshing holiday season treat for all! Heat oil in pan. Saute prawns for 1 min till just cooked. Let prawns cool and place into mixing bowl. Mash 1 avocado into a mixing bowl. Add in red onion, red chilli, garlic, lime rind, lime juice, sugar, tomatoes and the remaining diced avocadoes. Mix in ground cumin, salt, blackpepper and olive oil. 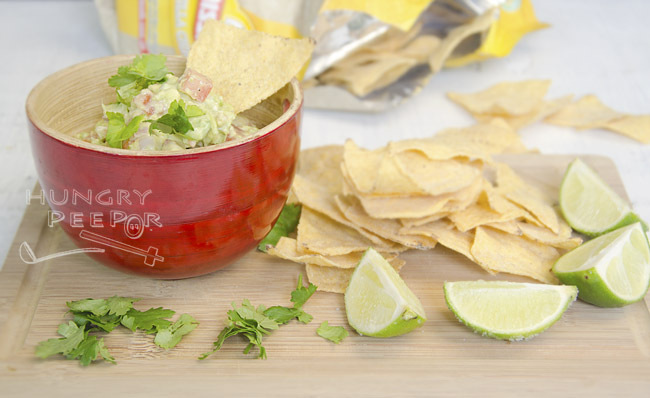 Serve with lime wedges (dipped in salt), coriander and tortilla chips. This can be a vegetarian option if you omit the prawns altogether. 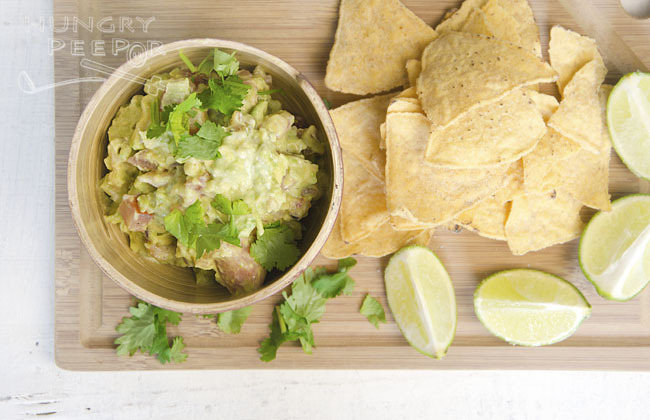 Squeezing in the lime can help to slow down the oxidation process of the avocadoes so that they do not turn dark so quickly while being served. This entry was posted in Dips & Sauces, Spanish and tagged Avocado, Prawn, Salsa, Tomato, Tortilla, Vegetarian. Bookmark the permalink.